Gary Barwin’s imagination knocked my socks off. History and adventure come together in this remarkable tale full of word play and wit, all told by a 500-year-old Yiddish-speaking parrot. So, you ask, how did this shell-less cheder-bocher – schoolboy – drawn from the waters of Ashkenaz find himself on the Spanish Main, the blade of his sword pressed against the quivering kishkas of Spanish captains? How did Columbus, the Inquisition, and the search for some books cause us to seek for life everlasting? And, come to think of it, how did I, an African Grey, become his mishpocheh, his family, and he my perch, my shoulder in the world? And so begins the tale of Moishe and Aaron, his parrot. A bookmark without a book doesn’t know where it is. Moishe was my slim volume, my scrawny story. My shoulder. The ship’s master unfurled the flag of the Spanish Kingdoms and planted it in the sand. For we shall have dominion over every living thing that moveth upon the earth and have a fancy brocaded flag to prove it. To be at sea is to know vastness, to understand the flight of clouds, the reach of the stars and of invention. He was riding the expanding ripples of God’s great cannonball. Moishe felt as if he were travelling in every direction at once, each direction away from home, toward story. Was I surprised my hopeful pink boychik Moishe had turned pirate? Feh. God Hisself would have turned pirate if, on bumping into the New World, He had seen that the othershtupping Spanish had discovered only a larger canvas on which to paint their murderous scenes. The same hateful fire burned inside their poxy hearts as fueled Inquisition flames. They had persecuted Jews. Now they persecuted Los Indios. and they search for the Fountain of Eternal Life. They suffer great sorrow but maintain hope for the future. I wish that we, too, could leave this meiskeit-ugly bloodletting. That we, too, could silently row out of this story and find another one, a story where more blood stayed in the body. Sha. I’m only looking for this treasure, these books, this poxy fountain, because, like a shlemiel, I still believe – keneynehoreh – in life instead of death. But, takeh, it’d be easier to be dead. And through it all, Aaron can’t help but crack his jokes. I smiled sheepishly. If a parrot could be said to be sheepish. Or to smile. This book comes with a warning: despite the jolly feel of the novel, there are some very graphic scenes of violence. You’re thinking it be the pirates. But, sadly, the worst of it comes from the “good guys”; the Catholics in Spain ridding the country of heretics, and the great explorers of the New World who think the Native Islanders are soul-less. Yiddish For Pirates is not a quick read, but every word is enjoyable. I giggled and smirked, felt anger and awe, and at the end of it all I shed a tear. I was sad to see Aaron go. For someone so accomplished, I’m embarrassed to say that I had never heard of him until his book made the Giller longlist. Happily, that has been rectified, and I hope the treasure that is Yiddish For Pirates will bring him much well-deserved recognition. Yiddish for Pirates is also a finalist for the Governor General’s Literary Award for Fiction. The review in the Globe & Mail claims that Yiddish For Pirates is “unlike anything else you’ll read this year”. The review in The Star reveals some of what Barwin was thinking as he wrote his book. Gary Barwin’s interview with Shelagh Rogers on The Next Chapter. *Thank you to Random House of Canada for sending me a copy of this book for review! This sounds wonderfully inventive, but thanks for the health warning. Because of the humorous writing style, it’s easy to forget that there are some terrible things going on. Nothing most readers can’t handle, I don’t think. After all, some people had to, or have to, live it. This sounds every bit as bizarre as the blurb made it out to be. But also like great fun! I would have been interested to read it just from the title, so I’m glad it lives up to it. Do you think it has a chance of winning? Interesting review letting the book speak for itself, which you always do but not to this extent. I’ve already got it ordered. I can’t wait to hear what you think of this one, Brian! Thanks for the introduction to this book. I haven’t yet seen it reveiwed by anyone else – maybe becasue it’s YA? No, it’s not YA – it’s fully adult. Not to say that some teens might not appreciate it. I haven’t seen it around, either, except on the lists and professional reviews. Got the Shteyngart blurb. Nice. Great review Naomi! Has the Giller ever gone to a weird/comic novel like this? I don’t think so. Fifteen Dogs would probably be closest. I love the variety we’ve been getting the last couple of years! Oh yeah I his 15 dogs was pretty weird! And Martin John was super weird too- and should have won, dang it. I think this guy has a shot! I love the voice you’ve captured here with the selection of quotes! Definitely going on my list. Fantastic piece Naomi! Beautifully-intriguing for those who haven’t read Barwin. Very true re: ‘had to, have to or live it.’ Shadow Giller is in splendid form! And, now I’m keen to read more Barwin – is he always this much fun? What a fun idea for your book club! You’re in for some good reading over the next seven months. 🙂 A variety of subjects and styles, and most of them lend themselves well for discussion. The Wonder is good, too – just haven’t written about it yet. Enjoy! And keep me posted about which ones your club likes best, and which generates the most discussion – I’d love to hear about it! I feel lucky, too, that the books have all been so good. I’d recommend any of them so far! This definitely sounds like a different kind of novel. I’m still trying to get the gist of it : but it seems like a seafaring adventure set during the Spanish Inquisition? For some reason I think of Life of Pi because of the animals I guess — but that’s not it. Interesting. Yes, it’s part sea-faring adventure (explorers and pirates), part historical fiction, and part search for a place to call home. (Not at all like Life of Pi.) It’s a little different and very good! 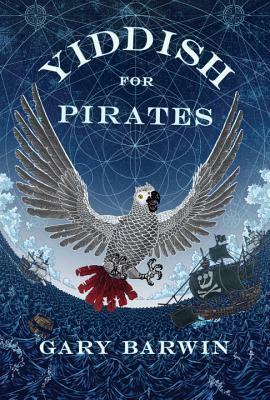 This one took me by surprise; I was expecting a pirate romp but it was more of a parrot romp and there was more non-pirate action overall and my reading pace slowed to a crawl so I could catch every word and delight in his playfulness. Who knew that a parrot narrator would be so entertaining and bookish too!? He’s a smart parrot, that’s for sure! In response to this part: “But, sadly, the worst of it comes from the “good guys”; the Catholics in Spain ridding the country of heretics…” I have an observation. You can’t have an inquisition without and Inquisition. Just ask Trotsky. Another great book on the Giller longlist! If you hadn’t heart of the author, I certainly haven’t either. But this book sounds delightful. So glad you enjoyed it. I commend you for writing such a cohesive review with many valuable quotes. It’s such a refreshing way to review a book. I may try it one day when I feel an itch to shake up my review style. I find that noting passages I like help me write the review later on. It’s especially helpful when it’s been a few weeks since reading the book (as sometimes happens)! I haven’t had a chance to read any of the shortlisted books yet, and I really appreciate hearing from you about all of them, Naomi! Are you planning to go to the Giller Light Bash in Halifax? It hurts me to say this, but I can’t go. My husband is away this weekend, so children duty is all mine. I do hope to watch it on the you-tube channel, though, if I can figure it out! I love living out here, but the city has its advantages, doesn’t it? Ah, that’s “Between the Pages,” tonight at the library — I, too, am hoping to watch it online. I should have mentioned the date — the Giller Light Bash is on November 7th at the Atlantica Hotel (http://gillerlightbash.ca/cities/halifax/). But I know that’s not exactly around the corner from your house…. I didn’t realize there were two separate events. There’s still some hope for November 7th! What about you? I bought my ticket yesterday. Let me know if you decide to make the trip to the city! Ah, too bad! Yes, let’s talk afterwards. This one is near the top of my to be read pile too!! Thanks for your review! This sounds so good! I love the wordplay and humor, but that it tackles some serious topics too. But I loved it, and if you like wordplay and puns, then you will too!